Welcome to Ouran High School Host Club Last Icon Maker Standing! This community is solely dedicated to Ouran High School Host Club aka Ouran. For those who don't know what a lims is...... here we go. A Last Icon Maker Standing (LIMS) is an icontest that pushes icon makers to their full potential as they go through a process of creation, elimination, and learning. At the beginning there is a sign up list and you must sign up for the rounds in order to participate. As each week goes by, the icon makers must create the best icon they possibly can in order to stay in the game. The elimination round is when members (members, moderators, or just people who have friend the community), vote out another person's icons. Basically you have to stay in the game too win. The icon maker who does not get eliminated will be crowned the Last Icon Maker Standing. Every few months, a round of LIMS is completed and a new round begins. At each round, not to be confused with a week, people are able to sign up on a list. If you miss the sign up, just wait until the next round begins. Every other round is themed. Even rounds are themed while odd ones have no theme. If you want to sign up keep checking back towards the end of every round. Spots go fast, we had one go overnight, so sing up quickly! 1. You may only use official anime/manga Ouran pictures. 2. Only submit one icon, unless directed otherwise. 4. Comment if you are dropping out for that week. 5. If you are going to drop out, just comment to the current week. 7. You can't submit if you were eliminated or dropped out. 8. Do NOT enter the same icon in multiple icontests. 1. Vote out TWO icons. 2. You must have a VALID reason as to why you are voting OUT. OK-The coloring is very off and the icon itself is not pleasing. WRONG- I don't like this -ship. 3. Everyone who is a member can vote! 4. [Member's choice] Choose an icon you like the best. Commentary is optional. 5. NO FLAMING! You will be banned. 6. Don't vote for an icon because you feel that you must. Cheating examples: telling people to vote for your icon, clone accounts, etc. 8. Don't vote for your icon as an elimination... that's just really stupid. 9. Don't vote for your icon as a members choice. 10. [Member's choice] commentary for MC can be all fangirl/boy stuff: ex. "OMG. I LOVE THIS PAIRING." 22- The picture is blurry and the text doesn't match the icon. 25- The icon is dark and over sharpened. If you do not give a good reason, I will ask you to revote. Each vote is only counted as ONE vote, no matter who the voter is. The person/people with the top amount of ‘out’ votes is/are eliminated, while the person with the top number of Member’s Choice votes are still in. Every week, the person with the most amount of “out” comments is eliminated. That means that they can no longer participate until the next round. Once you are out, you are done. No questions asked. LIMS who have won twice are NOT permitted to participate for one round. Post here to affilate with us. This layout was designed by mmrobitussin [with help from freelayouts]. The graphics and coding belong to their respected owners. 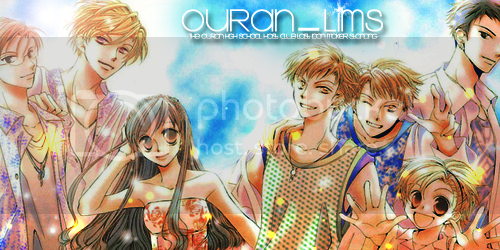 Ouran copyrighted by Bisco Hatori. If you participate in this, that means you have read the rules. Rules are subject to change with or without notice.